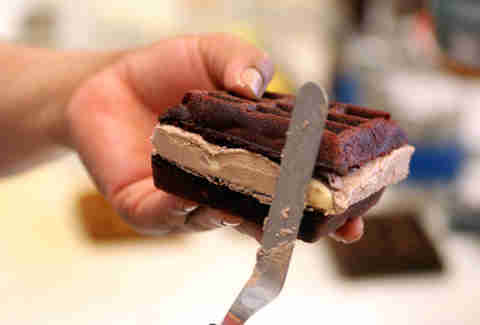 First Wonuts, and now waffle ice cream sandwiches. God bless Chicago. 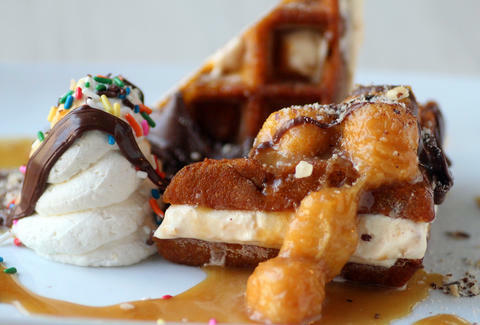 Less than a month after the Wonut dropped in Chicago, South Loop brunch spot Waffles (not to be confused with Waffles Cafe) is attempting to take the waffle game a step further, with these: Chi's first-ever waffle ice cream sandwiches. Here’s everything you need to know. 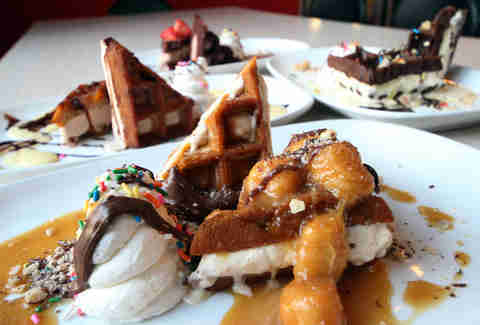 First: the waffles. 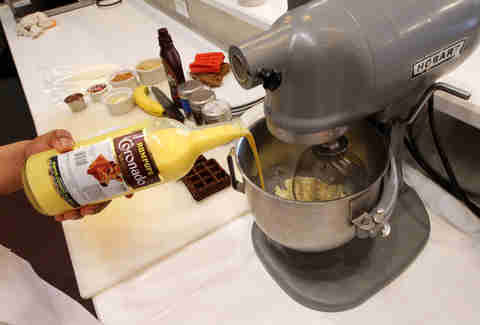 They're made using a pretty simple iron, and come in flavors like red velvet, pumpkin, chocolate, and even sweet potato. ... and... mmm... caramelized... mmm... bananas. 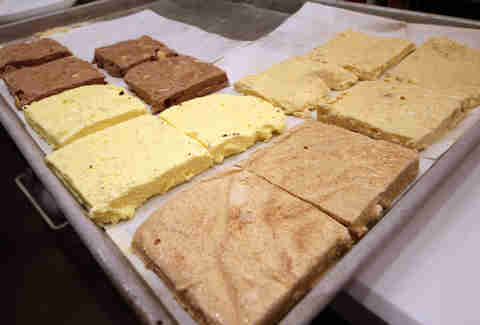 The ice cream is spread over a cookie sheet, re-frozen for a day, and then cut into handy squares. The waffles are deep-fried to keep their shape (and also, 'Murica! 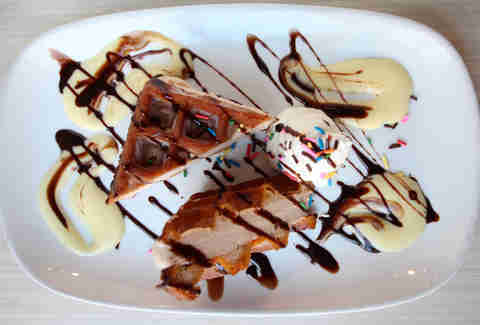 ), sliced, and sandwiched around the ice cream. 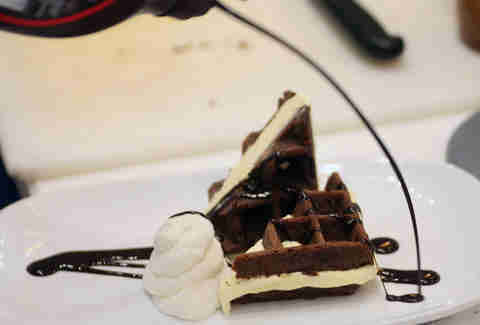 Then, they're all finished with fresh whipped cream and toppings like nuts, chocolate sauce, and Nutella. 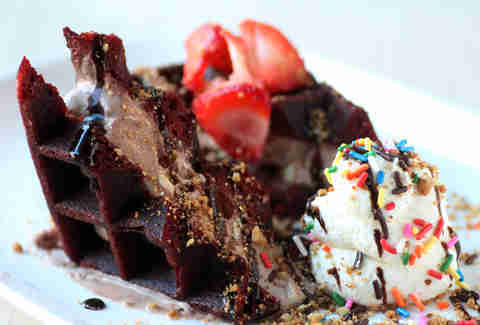 ... the sweet potato waffle with chocolate, cinnamon-swirled ice cream, and chocolate sauce applied by Jackson Pollock. Not sure how you up the waffle game any higher than that (*cough*cough*waffle pizzas*cough*waffle pizzas are how you'd up it even higher*cough*), but we'll keep you posted if anyone tries. Sean Cooley is Thrillist's Chicago Editor, and he can't wait to hate the upcoming song of the Summer. Follow him @SeanCooley.